All Posts Tagged With: "deep hair conditioner"
Fall will soon be turning into winter- wreaking total havoc on your hair! Did you know that in order to keep hair healthy during the winter months, you should begin preparation now? 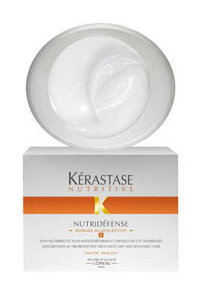 Kerastase NUTRIDÉFENSE is an excellent conditioning treatment that replenishes and saturates the hair with a lightweight softness while offering anti-dryness protection to counter the effects of harsh external elements.